President Barack Obama talks about climate change in this video. Moreover, he delivers this message at the Climate Conference in Paris in this video. President Obama says that we have to face our responsibility to do something about climate change. Hasn’t he looked outside his Paris hotel window to see “climate change” being manufactured in the sky, so what will he and other world leaders do about THAT climate changing tactic? Regardless of all the platitudes Mr. Obama offers, he and all the 200, or more, Climate Conference attendees will fail—or perhaps, deliberately will neglect—to address the PRIMARY GLOBAL climate change mechanism that’s employed by governments and independent contractors who DAILY are involved in aerosol spraying of the skies above our heads, thereby creating false, man-made, technologically-produced weather patterns as documented in NASA and NOAA charts and videos showing aerosol spray grids. The blatant atmospheric aerosol spraying so clearly seen of the coast of California in the satellite photo below is nothing short of shocking. These programs (combined with the other US military operations already mentioned), have played a major part in the collapse of life in our oceans, most especially in the Pacific. If the oceans die, we die. The US Navy has long since been using live depleted uranium ammunition and devastating sonar devices along the Pacific coast (the US Navy is now also waging electromagnetic warfare along our forests and our coasts). The US (and other nations) have also routinely dumped nuclear waste into our oceans. The excerpt (shown below) from the US Navy’s “Environmental Impact Statement ” is beyond shocking. Their position is this, if there are no studies to prove the harm they are causing, then no harm was caused. Each color shade above reflects a 2-3 degree “departure from normal temperatures”. If this NOAA map does not alarm you, it should. 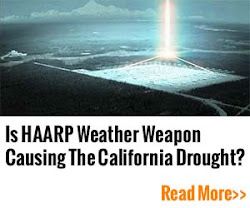 All the weather modeling for the National Weather Service and the National Oceanic and Atmospheric Administration (both organizations now have federal “gag orders” placed on them) is done by Raytheon, who is also heavily involved in climate engineering. The radical imbalance reflected in the NOAA map below will worsen as the climate engineers continue to chemically cool selected regions on a rapidly warming planet. The most important and “prime time” topics and issues that probably will never be discussed at the Paris Climate Conference can be delineated in the above paragraph: The roles of the United States federal government agencies working in collusion with corporate ‘powers’ as predominant actors, plus financial rewards generated, to effectuate weather geoengineering, solar radiation management, aerosol spraying aka “chemtrails,” and the involvement of electromagnetic frequencies generated by HAARP and other nation-states EMF technologies . That very point—less sunlight hitting the surface of Planet Earth—impacts many aspects of life on Planet Earth: food growing—famines? ; human health adversely affected by improper productions of vitamin D from sunlight interacting with cholesterol under the skin; and seasonal affective disorder (SAD), which may become a full-time emotional disorder rather than a wintertime, short daylight affective psychological disorder. Currently, independent researchers are estimating that between 25 and 30 percent LESS sunlight is hitting Planet Earth due to aerosol spraying. Readers probably can substantiate seeing less sunlight by recalling just how many totally overcast days they experience in their areas, especially when a day starts out with blue skies, and then chemtrail pilots do their “thing” and lay down toxic chemtrails that create large ‘blanket’ clouds which overtake the sky blocking sunlight, creating a dank, dreary, gray day with unknown weather patterns elsewhere on the planet to be steered by microwave energies. To end, I ask all attendees in Paris a personal question (along with providing my article “An Indisputable Database for Chemtrail Deniers”): Won’t you please do the right thing by Planet Earth, Mother Nature and Humankind, and stop aerosol spraying? 2 Comments on "Non-sequitur Climate Change Issues in Paris"
I’m so happy to finally see this in print! Governments all over the world are in cahoots on this climate change idiocy, in order to bring in one world government/Cap and Trade. But they’re the ones creating it. I’ve often wondered how much of our tax dollars are paying our government/corporations to destroy the planet. and I’m sure that Mike from the EPA never got back to you. The EPA turns a blind eye and yet all of their children will be affected by this insanity.